Charlotte lawyer Heriot Clarkson sat atop Grassy Mountain in June, 1909 surveying a 360 degree vista that stretched for miles below him. Mount Mitchell, the highest mountain east of the Mississippi, was just a few miles away to the southwest. Grandfather Mountain, reputedly the oldest in the Blue Ridge chain, was off a bit farther to the northeast. The distinctive shape of Table Rock rose over the rugged Linville Gorge in the east, and Roan Mountain with its large natural rhododendron gardens rimmed the skyline in the north. Cool mountain breezes wafted over the ridge. Clarkson was a mover and a shaker. A prominent member of the Democratic Party, he served as an alderman and state representative for Charlotte. He was involved with party politics of the late 1890s, when the Red Shirt Movement conspired to re-assert Democratic control of state government through the dissolution of the union between Republicans and African Americans that had swept the G.O.P. to power, and to disenfranchise African-Americans from voting. He was also involved in the Prohibition movement that saw legal alcohol sales outlawed from 1920 to 1933. Clarkson, along with Harriet Morehead Berry, spearheaded the Good Roads Movement in North Carolina. Their efforts led to the landmark 50 million dollar bond sale by the North Carolina Legislature that was used to build a network of paved highways statewide. Clarkson also served as campaign manager for Cameron Morrison’s successful bid to be North Carolina’s governor. He was later named an associate justice to the North Carolina Supreme Court, a position he held from 1923 until his death in 1942. Heriot Clarkson had a vision for leisure. He was seeking a mountaintop paradise where a respite from the summer’s heat, combined with scenery and a simpler way of life, would rejuvenate spirits and foster a community. Contacting Reid Queen and Floyd Gardner, real estate agents in Marion, he expressed his desires for property that would meet his dream. Queen, a native of Phenoy, a small community in southern Mitchell County, had an idea of some land that might fill the bill. The three men boarded a train to Spruce Pine, and from there set off to view the property on mules. After their trip to Grassy Mountain, Clarkson returned to Charlotte and formed the Switzerland Company with a group of twelve investors. They directed Queen to procure 1,100 acres, including Grassy Mountain and nearby Chestnut Ridge, to start their venture. 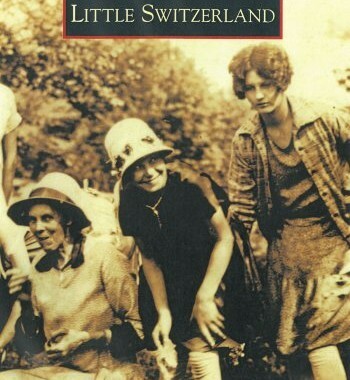 Anna Twelvetrees, a secretary to one of the investors, suggested the name “Little Switzerland.” She came up with the idea after hearing Clarkson’s description of a recent trip to Switzerland, surmising that the terrain in the region resembled that of the European country. Judge and Mrs. Heriot Clarkson, August 1939. After receiving Clarkson’s OK to proceed with the purchase, Reid Queen returned to the Phenoy community seeking landowners willing to sell. Several agreed, including Nancy Buchanan, who owned a significant tract along the mountaintop that had been in her family for generations. In exchange for her property, The Switzerland Company gave Buchanan a life estate to live in her home until her death, which occurred in 1935. Queen put together acreage that straddled the Mitchell/McDowell County boundaries for the proposed community. In the summer of 1910, The Switzerland Company began development, dividing their purchase into lots and drawing up common community rules such as outlawing alcohol sales, establishing a one house per lot restriction, and determining lots where commerce could be conducted. The company then began soliciting buyers for lots. Sales were slow to begin with, as the property had little more than paths connecting it to the surrounding communities. The company began remedying the access situation by persuading the Carolina, Clinchfield, and Ohio Railroad to locate a station approximately 4 miles from the community, then proceeding to construct a toll road known as the Etchoe (pronounced Et-chō) Pass Road. Visitors paid hacks to take them from the railroad station to Little Switzerland, paying tolls ranging from 5 to 50 cents for passage over the road. Tolls ceased to be collected on the roads after only a few years, but the tollgates marking the boundaries of the community still stand at the sides of NC highway 226-A, the current road through Little Switzerland. The Switzerland Inn, photographed sometime soon after it opened in 1911. It was operated by Ida Clarkson Jones (sister of Heriot Clarkson). The building was demolished in 1961 and replaced with today’s current Switzerland Inn. Relations between the summer residents (as they became to be called), and the families who had lived in the region for generations were strained at first. Many of the natives were unhappy with their new neighbors, whom they felt were encroaching on their homes. Clarkson, however, was loved by many of the mountain people because of the respect he showed them. Eventually, economic opportunities brought the two sides together in a symbiotic relationship. Local craftsmen helped the residents construct their summer cottages, and local farmers sold produce and meat. Friendships sprang up between families, some of which have continued through the decades. Construction of The Switzerland Inn, which was owned and operated by Clarkson’s sister Ida Clarkson Jones, was completed for the 1911 summer season. The Inn proved to be a hit with flatlanders seeking relief from the summer heat; it was booked solid each season. For $7.50 per week, visitors enjoyed fine accommodations along with fresh, home-cooked meals that often used fruits, vegetables, and livestock raised in the community. In particular, the fried chicken dinner was a popular meal at the Inn. Shortly after the Inn was constructed, Miss Marie Dwight of Charleston, South Carolina purchased 150 acres of property nearby and opened Camp As-You-Like-It in 1914, purportedly the first girls camp in Western North Carolina. Each summer through 1968, approximately 125 girls called the camp home for an eight-week session. The Blue Ridge Parkway began approaching Little Switzerland in the late 1930s. Initially, Clarkson and The Switzerland Company applauded the new road, seeing it as an opportunity to open the community to visitors. But when they saw the plans for the roadway, which included an 800 foot-wide right-of-way through the middle of the property, they opposed its location, saying the plan took too much land and paid too little for it. The company filed suit in Mitchell County Superior Court, seeking $22,000 for their property. At the conclusion of the trial, the Company was awarded $25,000 for their property, a much-reduced right-of-way, which approaches 200 feet in width in some locations (the smallest right-of-way width in North Carolina), and an entrance to the highway at the rear of The Switzerland Inn, the only connection to a commercial property on the Parkway. Fourth of July celebration, 1935, at Kilmichael Tower atop Grassy Mountain. The Wohlford Road that led to it from the Blue Ridge Parkway was bulldozed shut by the National Park Service over a spat concerning advertising signs placed along the Parkway by its entrance. Relations between the Company and the National Park Service continued to be strained, as the two clashed over advertising signs placed on the Parkway for Kilmichael (pronounced Kill-michael) Tower, an attraction The Switzerland Company built atop Grassy Mountain to give visitors access to the vistas Clarkson first viewed in 1909. The Park Service bulldozed shut a road connecting the Tower to the Parkway over the spat, resulting in another lawsuit by The Switzerland Company. The suit was unsuccessful in re-opening the road, though, and The Tower was closed and fell into disrepair. Its base is all that remains today. Little Switzerland remained much the same until the 1960s, when William Cessna purchased The Switzerland Inn and razed it, constructing a modern motor court and restaurant in its place. Tourism began increasing in importance and new developments have brought additional summer residents. However, “downtown” is much the same as it was a century ago, with a bookstore, restaurant, general store, and post office comprising main street. While many changes have recently taken place, the community has managed to maintain much of its charm even with development. Clarkson’s vision for a mountaintop paradise as a respite from the worries of life has continued. This June, Little Switzerland is inviting all to events celebrating its 100th year as a community; to come and see why Clarkson and others have uttered the phrase: This is the place. ← Spruce Pine NC is WET!! !